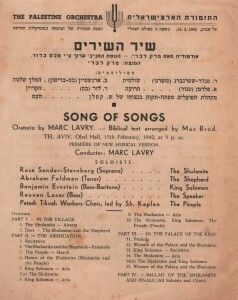 One of Lavry’s major compositions, the oratorio “Song of Songs” was composed together with lyricist Max Brod and the collaboration of Helena Lavry, the composer’s wife. Max Brod changed the order of the phrases, without changing the biblical text, thus recreating what, he believed, was the correct sequence of the ancient story (see his full article.) The outcome is a lyrical drama of four scenes: In the Village – The Abduction – In Kings Solomon’s Palace – Ballad of Shulamith. The oratorio, written for soloists, choir and orchestra, is considered one of the most influential choral works and a milestone in Israeli Music. 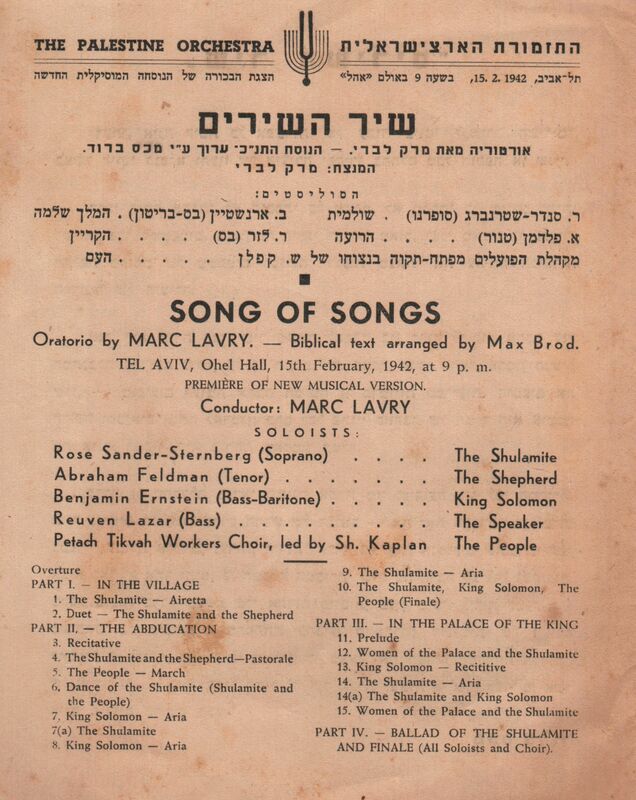 Composed in 1940 it was premiered on October 22 of that year by the Jerusalem Radio Orchestra. 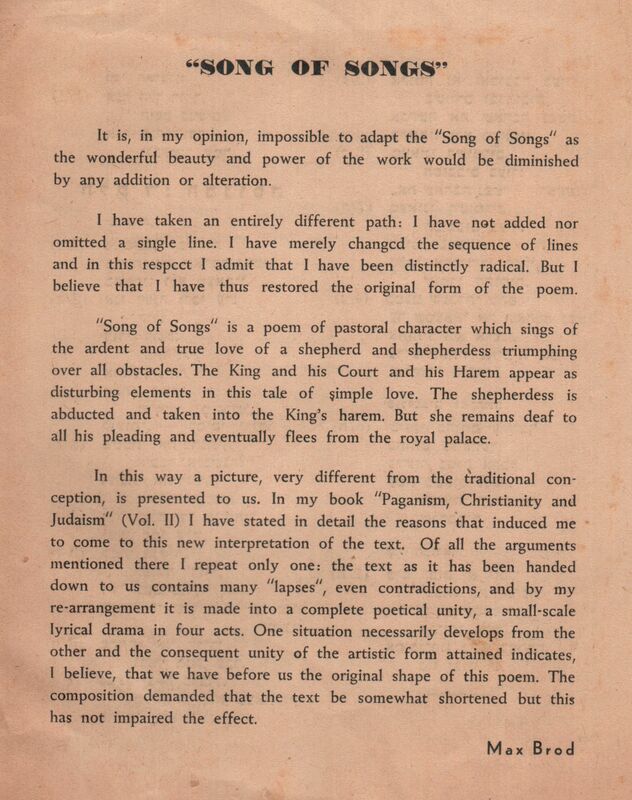 It is, in my opinion, impossible to adapt the “Song of Songs” as the wonderful beauty and power of the work would be diminished by any addition or alteration. I have taken an entirely different path: I have not added nor omitted a single line. I have merely changed the sequence of lines and in this respect I admit that I have been distinctly radical. But I believe that I have thus restored the original for of the poem. “Song of Songs” is a poem of pastoral character which sings of the ardent and true love of a shepherd and shepherdess triumphing over all obstacles. The King and his Court and his Harem appear as disturbing elements in this tale of simple love. The shepherdess is abducted and taken into the King’s harem. But she remains deaf to all his pleading and eventually flees from the royal palace. In this way a picture, very different from the traditional conception, is presented to us. In my book “Paganism, Christianity and Judaism” (Vol. II) I have stated in detail the reasons that induced me to come to this new interpretation of the text. 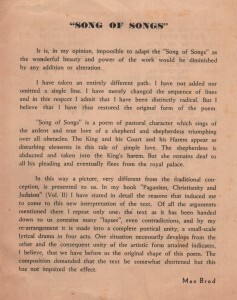 Of all the arguments mentioned there I repeat only one: the text as it has been handed down to us contains many “lapses”, even contradictions, and by my re-arrangement it is made into a complete poetical unity, a small-scale lyrical drama in four acts. One situation necessarily develops from the other and the consequent unity of the artistic form attained indicates, I believe, that we have before us the original shape of this poem. The composition demanded that the text be somewhat shortened but this has not impaired the effect. The Israel Symphony Orchestra Rishon LeZion will play Marc Lavry’s aria Kol Dodi (The Voice of my Beloved) from the oratorio Song of Songs, in their third concert for the 2013-14 season. Rishon LeZion, Heichal Hatarbut: November 23, 24, 26, 2013 at 8:30PM. Ashkelon, Heichal Hatarbut: November 27, 2013 at 8:30PM. For more information and to purchase tickets go to the Israel Symphony Orchestra Rishon LeZion website.